Joon-ho Bong’s Snowpiercer is about a very long and seemingly unstoppable train running all over a post-apocalyptic snowscape. The movie based on the comic Transperceneige by Jacques Lob, Benjamin Legrand and Jean-Marc Rochette. Its passengers are the last survivers on Earth, and they must live in their own microcosmic class system inside that rattling ark. The wealthy ones live comfortably near the front, the lower classes live in squalor and poverty in the tail end. They only meet when the wealthy ones come and take another kid with them. Nobody knows where those kids end up. There are schools, prisons, food processors and water purifying systems on board. The best scenes of the movie contain Mason, played by Tilda Swinton, who speaks in the name of the creator of the train, a man called Wilford, who may or may not be along for the ride. 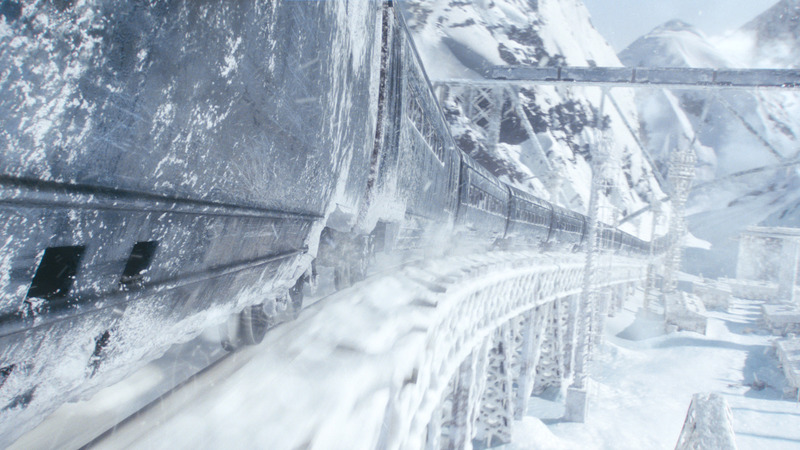 Snowpiercer races on a gigantic circular track, so is a driver really necessary? Mason declares the train’s engine to be sacred, and is absolutely clear about who belongs where. Her twisted explanations are the highlight of the movie. Her appearance reminded me of Maggie Thatcher, which cannot be a coincidence. 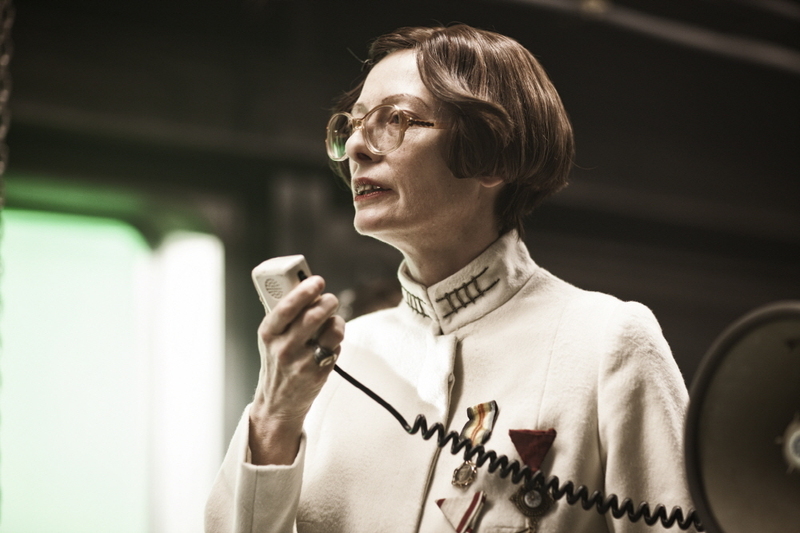 There is a malignant glee in Swinton’s whole performance that saves a lot of scenes. There is unrest, led by Curtis (Chris Evans) and organized by an old man called Gilliam (John Hurt) who seems to know a lot about the front end. With them are a security expert (Kang-ho Song), who helped design the doors of the train, and his daughter (Ah-sung Ko). There are also a mother and a father of two of the missing kids (Octavia Spencer and Ewen Bremner), and a hothead named Edgar (Jamie Bell). They all fight for a just distribution of food, water and space and want to make their way to the front of the train so that all passengers can be made equal. Fights ensue, as I guess they must, only they go on for too long and are too violent. The lower classes get decimated more and more, and it is only for a few chosen ones to reach the sacred engine. What happens there is not for me to reveal, but although the dialogue about the necessity of the class system is cruelly logical, that scene could have been handled a lot better. 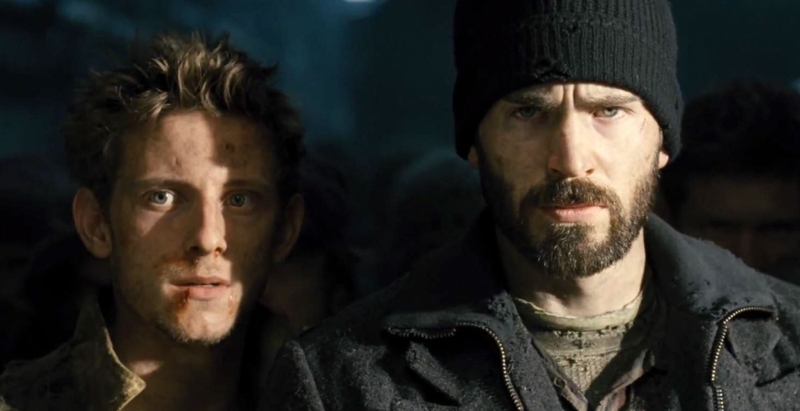 Snowpiercer never quite finds its own rhythm. There should have been a breathtaking establishing shot of the train in its entirety, since that is what the movie is all about. Instead, there is a first shot of the tail end, then we are inside again. That’s a missed chance to wow us with the enormity of the vehicle, all the more because the few glimpses of the train we get throughout the movie are really convincing CGI. I have a suspicion that the movie got cut and re-cut until the pacing got screwed up. There are glimpses of greatness, though. I liked the scene where they find the showers and are able to wash properly after months, if not years. The first time they eat real food again. The moment they realize they are touched by the rays of the sun through a window, and they don’t know if the window or the natural light is the bigger miracle for them. I especially liked that the apocalypse wasn’t anything to do with nuclear war, but was brought about by people who thought that they had the solution to global warming. They turned the environment in such a hostile place that those who tried to escape the train stand frozen in place as statues to their own stupidity and can be seen from the train as a reminder. And there is a morbidly cheerful performance by Alison Pill as the schoolteacher. The ending is crap. It does not make much sense, and the movie cowardly abandons its characters. Instead of having a wide open ending, it ends with the beginning of another movie.